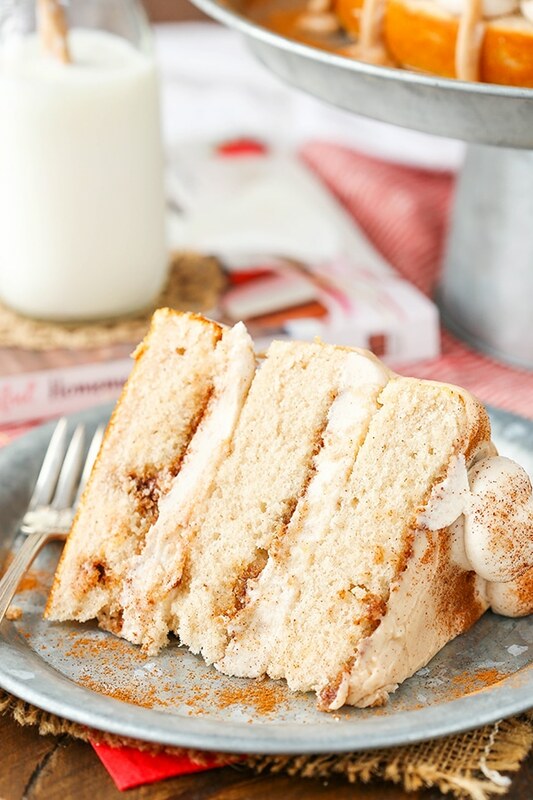 This Cinnamon Roll Layer Cake is to die for! 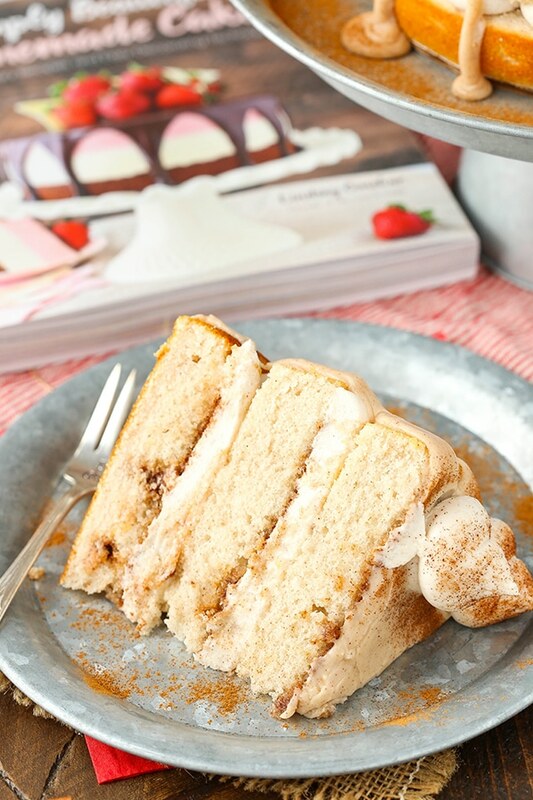 SO full of cinnamon in every bite – and it’s a recipe I’m sharing with you from my cookbook! Yay! So yesterday was the day! 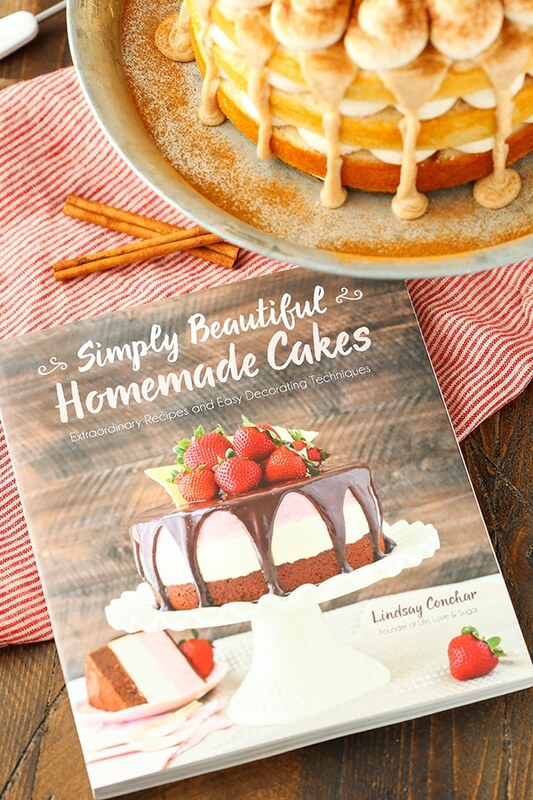 The cookbook is officially out there for everyone to see, buy and bake from! This is what it’s all about you guys. I didn’t write a cookbook for myself – I wrote for you! The best part of yesterday was hearing from anyone who has gotten a cookbook in the mail and was excited about it. I love seeing the posts/comments/emails – it makes my day! If you’re wondering what I did to celebrate, the answer so far is not too much. Tuesdays are a tough day, but I did pop some bubbly with the hubs Monday night and since we had our church group last night, I took some bubbly with me to that too. 🙂 We’ll be celebrating more formally in a little less than two weeks, when I host a little par-tay. The other thing I’m looking forward to is going to the bookstore to see it on the shelf! I had really wanted to do that yesterday but the hubs was super busy with work. He left before I woke up and got home late. I could’ve gone to the store without him, but he would’ve been super disappointed and I would have been too. As much as I was the one to actually write this book, it took both of us for it to happen and he should be with me. Hopefully today we’ll get to go together. So now let’s talk about this cake! YOU GUYS!!!! THIS CAKE!!!!! It’s incredibly hard to pick a favorite from the book, but this one is right up there. If you know me and this blog well, then you know I love me some cinnamon. This cake is FULL of it! 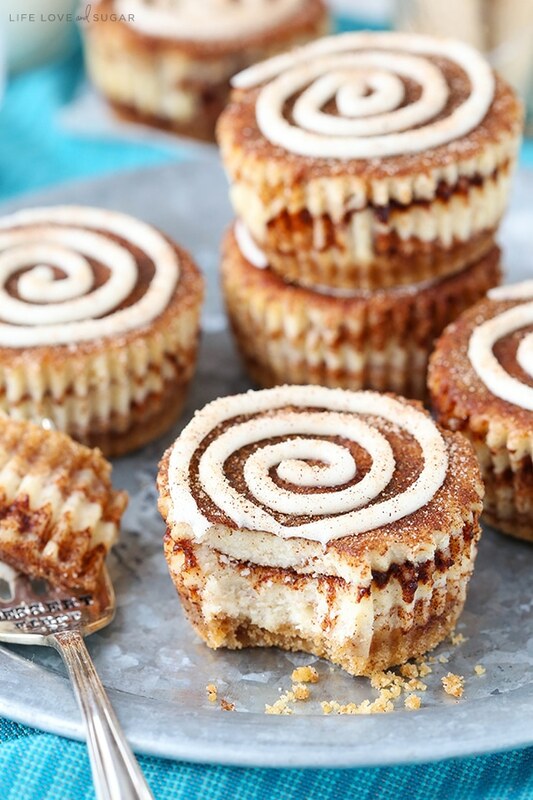 There’s cinnamon in the cake layers, there’s a layer of cinnamon filling (kind of like from a cinnamon roll) spread on top of the cakes, there’s cinnamon in the frosting and there’s cinnamon in the icing drizzled down the sides. Pure heaven. Like for reals. I didn’t just want to spread melted butter over the cake. That just seemed like too much and super buttery. I love butter, but that’s not really what I was going for. So I played around with it quite a bit. I honestly don’t even remember all the different versions I went through but I can tell you the first several versions ended up super sticky (they were cooked on the stove first). You guys trust me when I tell you now that it’s just right! 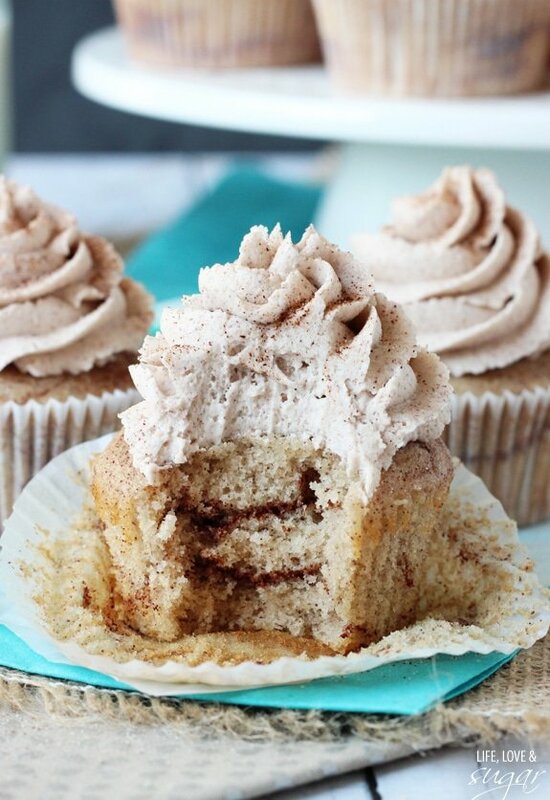 It is the best part of the cake – so cinnamon roll-y! And since this version is “naked” I needed a drizzle. I grabbed the icing from the Root Beer Layer Cake (on the following page in the book) and altered it a bit to make it cinnamon, instead of root beer. I am IN LOVE with it on this cake! Perfection! The frosting technique between the cakes layers is fairly simple to do as well (and there are photos in the book!). Just pipe dollops around the edge (I use the Ateco 808 icing tip), smooth off the tops a bit and add the next cake layer on top. Just try to make sure that your dollops are about the same size/height so that the next layer of cake sits evenly. The final cake really is to die for! My mouth is watering just thinking about eating it again. 🙂 You’ll definitely want to try this one! 9. To make the frosting, beat the butter and shortening together until smooth. 10. Slowly add half of the powdered sugar and mix until smooth. 11. Add the vanilla extract, ground cinnamon and water or milk and mix until smooth. 12. Slowly add remaining powdered sugar and mix until smooth. Set aside. 13. To make the cinnamon sugar glaze, add the powdered sugar, brown sugar and cinnamon to a small bowl and whisk to combine. Add the water and whisk until smooth. 14. To put the cake together, use a large serrated knife to remove the domes from the top of the cakes so that they’re flat. Place the first cake on a serving plate or a cardboard cake round. 15. 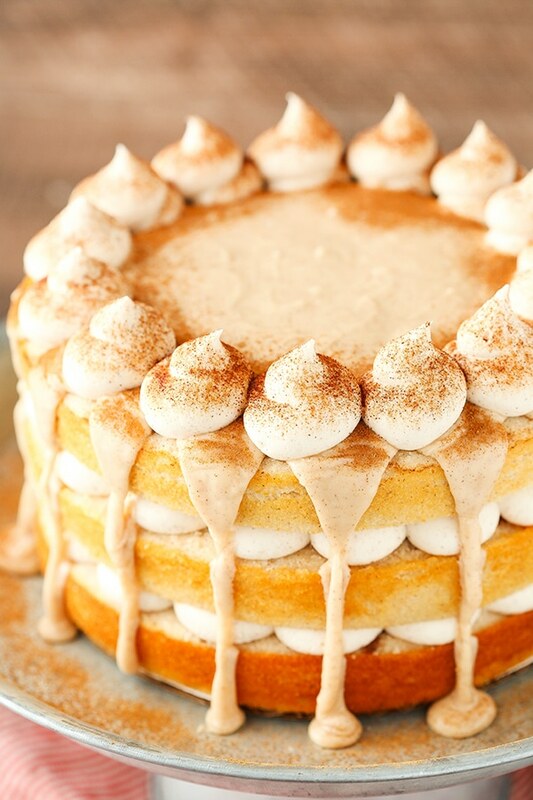 Spread 2 1/2 tablespoons of cinnamon sugar glaze over the cake layer. Allow it to soak into the cake. Pipe dollops of frosting onto the cake. Try to make sure the dollops are about the same size/height so the next cake doesn’t sit lopsided. 16. 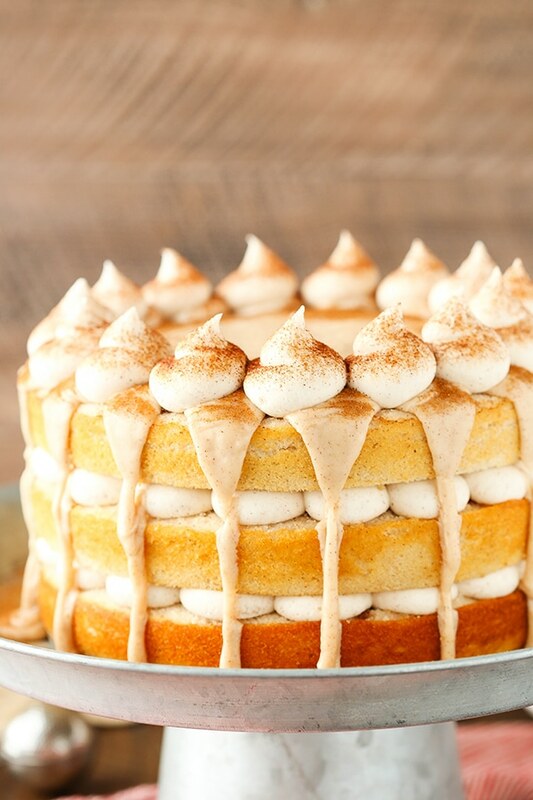 Repeat the process with the second layer of cake, glaze and frosting, then add the final layer of cake on top and the final layer of cinnamon glaze. Set cake aside. 17. To make the icing, combine all ingredients except for the powdered sugar in a small sauce pan. Heat on low until sugar is melted, then turn heat to medium to bring to a boil. Boil for 3 minutes, stirring occasionally, then remove from heat and immediately pour into a heat-proof glass bowl. 18. Whisk in powdered sugar and allow to cool slightly and thicken. If you find your icing to be a little thick, just add a touch more water to thin it back out. 19. Drizzle the icing down the sides of the cake while still a little warm. It will be too firm to pour and get a nice drizzle if it cools completely. 20. Use the remaining frosting to pipe dollops around the outside edge of the cake. 21. 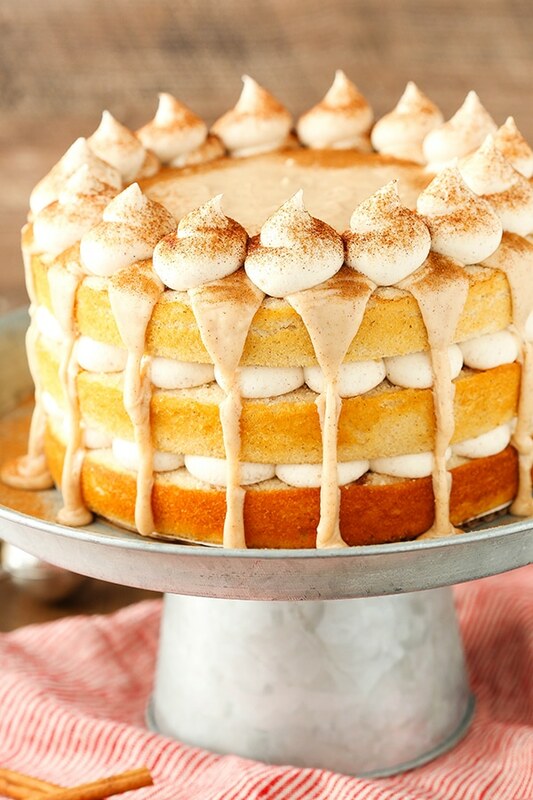 Fill in the top of the cake – between the dollops – with the remaining icing. Finish off the cake with a sprinkle of ground cinnamon, if desired. Store the cake at room temperature in an airtight container. The frosting recipe above reflects the amount I used in the cake as shown in the photos above. The version in the cookbook uses more frosting and lends a fully frosted cake. I REALLY, REALLY want to try this! 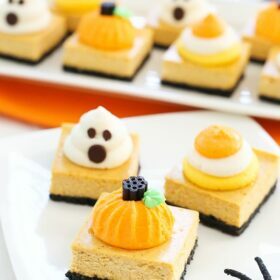 I would love to make and eat this! 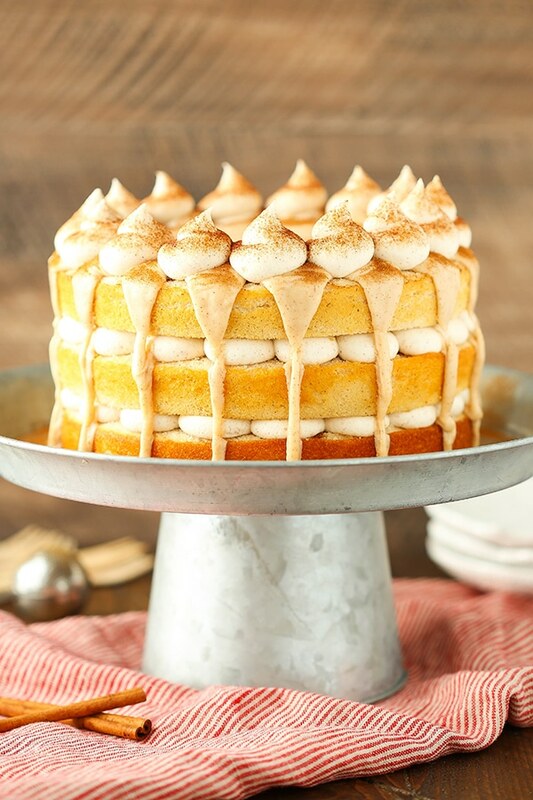 I will try to make this delectable looking cake for Thanksgiving! This cake IS simply beautiful, Lindsay! MY mouth was watering just looking at the photos (which are gorgeous)! This is a great cake for Thanksgiving as an alternative for people who don’t like pumpkin pie (trust me – we exist!). Looking forward to reading your cookbook and all of your decorating tips; you really do create some masterpieces! Congratulations on your cookbook. It is absolutely beautiful! I got mine in the mail yesterday but didn’t get too much time to look through it – I was too busy making your Mini Cinnamon Roll Cheesecakes, which are delicious (we share a love of cinnamon). 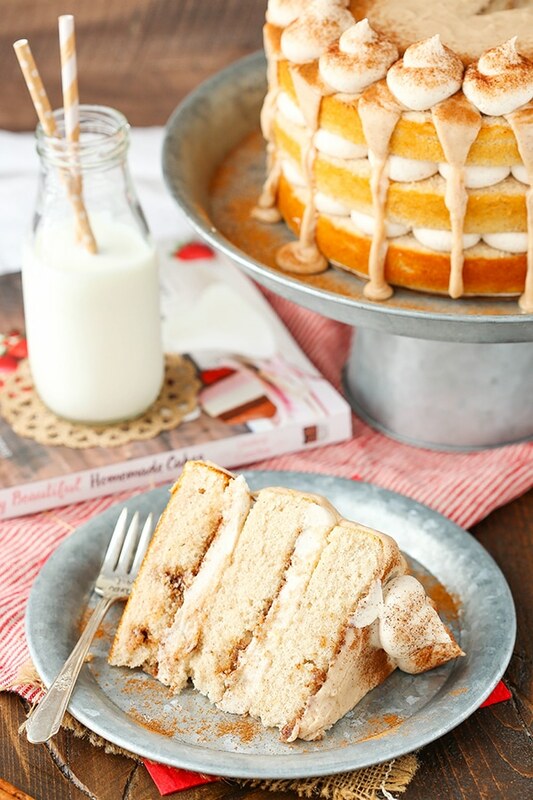 I love the look of both versions of your Cinnamon Roll Layer Cake. I can’t wait to sit down and really read your cookbook. Everything looks stunning. You must be so proud! Hey Lindsay!!! You did such an amazing job on your cookbook. I already went through it a few times and I love everything!! Every recipe and photo all look so unbelievably delicious!! 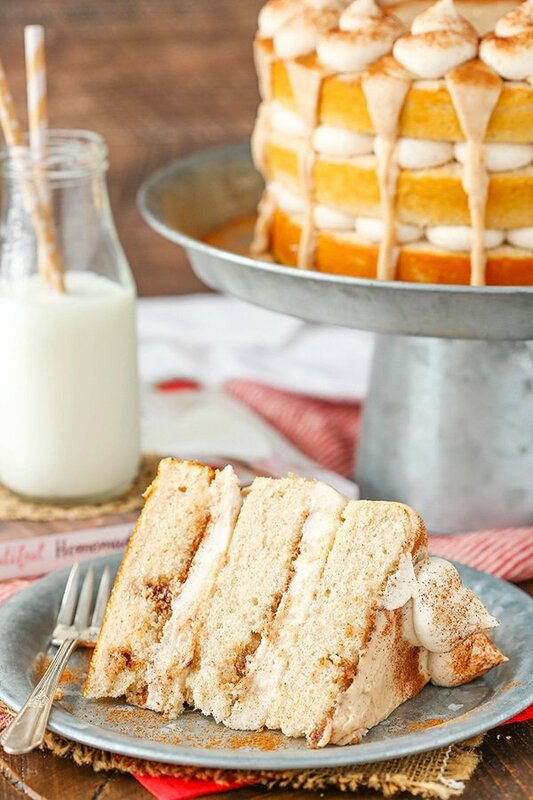 The Cinnamon Roll Layer Cake stood out to me because of my love of cinnamon rolls so I am beyond excited that now I have two verisions to make!!!! This cake isn’t simple beautiful, it’s amazing. very goo job! congratulations! HEY Lindsay! FIRST .. THANK you for a lovely blog.. i just found it, and im in LOVE!! all your creations are amazing, really!! im from denmark and i love to bake, often i you americans website, your bakering are much more fantastisc! but i have a problem, here in denmark we havent shortening, so what can i do? im in crises, because a lot of your cakes call for it?! hope you would help? again thank you for a lovely blog! I should of asked this earlier Lindsay, I want to make this cake for my son’s birthday which is tomorrow. I’m pressed for time and would like to make it today. But if making it a day early isn’t recommended I’ll wait until tomorrow. Your advice please. Hi Pam! Sorry I didn’t get back to you sooner! For future though, I’d say it’s fine to make ahead. I might personally make and add the icing drizzle the day off just so it stays fresh-looking, but the rest would be fine. That’s OK Lindsay, I realize you’re busy. I made the cake layers the day before and the rest the day of. Turned out great, a huge success with the guests and birthday boy! I would send a picture but do not see the option. Thank you for making this Mom a Superstar that day! 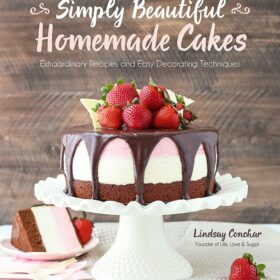 Hi Lindsay, I’m going to be making this for my roommate’s birthday tomorrow, and I was wondering how much extra of each ingredient I would need to frost the entire cake? I would suggest doubling it. I’d love to make this cake tomorrow for my mom’s birthday. Do you have a specific reason for using egg whites only, instead of whole eggs? 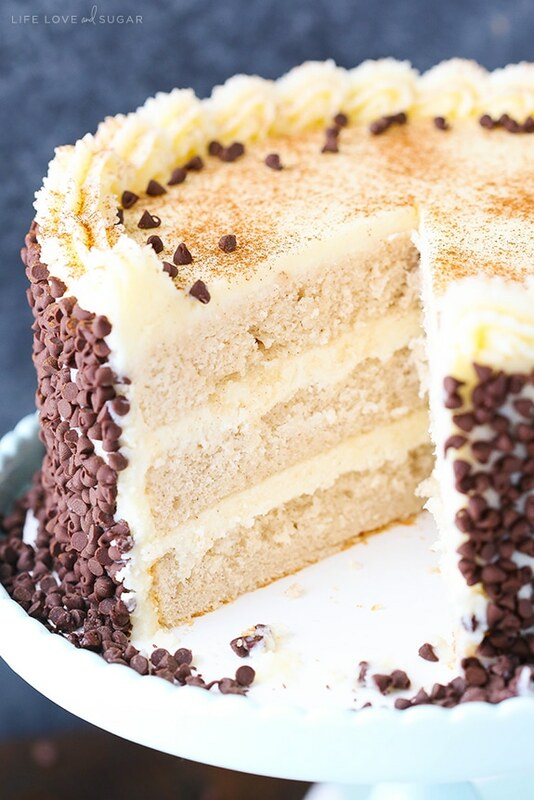 Is it for flavor/texture, or just to avoid the yellowish shade on the cake? I hate wasting egg yolks, and I’m not planning on making any custard soon. 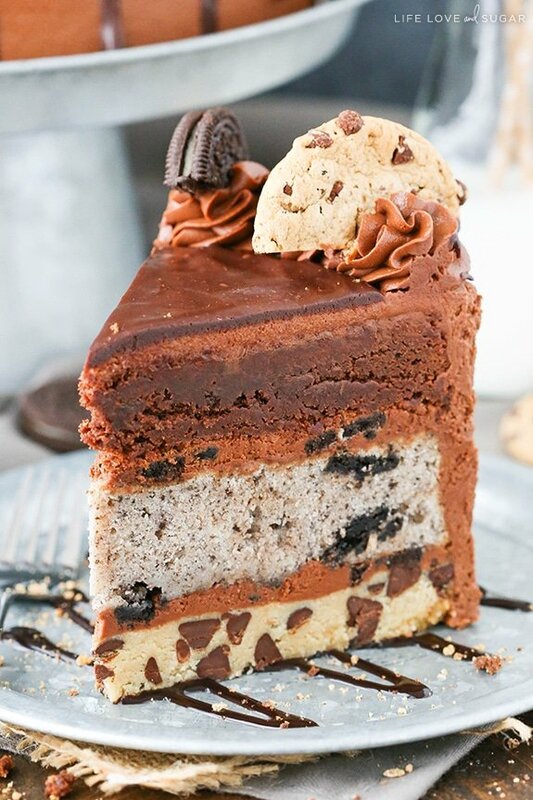 Hi, I’m wondering if I bake the cake layers a day or two in advance of assembling/frosting, if you recommend storing the cakes at room temperature or refrigerated/frozen? Also, would I add the glaze on the day of baking or the day of assembling? Thanks so much! This will be our Christmas Eve dessert this year, yum!!! I’d probably say to wrap them well and store them in an airtight container at room temperature, if it’s just a day or so. I’d add the glaze when you assemble the cake. I hope you enjoy it! Merry Christmas! Can you help me out? Should I skip or just add in whenever? 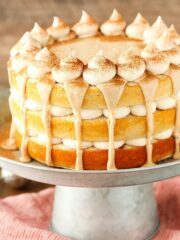 This is with regards to your cinnamon roll layer cake, my husband loves cinnamon and I would like to make this for him. Is it necessary to use only egg whites and not the whole eggs? I don’t want the yolks to go to waste. I’m sorry, but yes. The doesn’t work with whole eggs. You could try this recipe though and add the cinnamon to it. Thank you so much, Lindsay. Our best to you, hubby and your Babies.